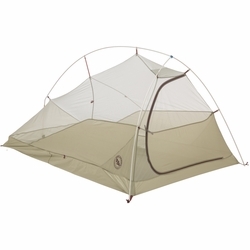 Big Agnes Fly Creek HV UL2 Tent. The award winning Fly Creek tents have been redesigned with steep wall architecture and a vertical door to maximize floor and head space. These features create more livable space so you can be more comfortable in the backcountry. All of the weatherproof and technical features of a three-season tent, with ultralight materials to keep the Fly Creek your go-to, easy to set up shelter when you need to pack ultralight. Give your tent floor some extra tlc.